Last week Beth over at Jam and Clotted Cream posted a recipe for Leek & Stilton Bread & Butter Pudding that sounded so good I knew I needed to make it right away. She made a big dish of it & served it as an entrée. I decided to make it into individual side dishes & serve it alongside a grilled steak, it felt like a fancy steakhouse dish to me. Matt & I both love leeks, bread puddings & cheese so we knew this would be right up our alley. This is a really warm satisfying dish though I was a little heavy-handed with the Danish blue cheese & it was a bit overpowering, part of that may be when I did the conversion from grams to ounces I rounded up, so I've slightly changed the quantity in the recipe below. Matt thought I made it with a little too much bread & would have liked it more custardy. I personally really liked the bread texture to mine. We'd like to try making this again though next time we may use all gruyere instead of the blue cheese & cheddar. Beth used granary bread in hers something I've never seen around here &, after some research, discovered I'd would need to buy a few things to make. I asked her what would be a good substitute & she said wheat bread or white bread would work just fine. I ended up using some homemade white bread enriched with wheat bran & it worked great. Heat the olive oil in a small sauté pan over medium-high heat. Add the leeks & cook until they are soft. Set aside. Cut circles from your bread just big enough to sit inside your ramekins. Coat one side of each slice with a little butter & them mustard. Whisk the egg & milk together until well blended. Season with salt & pepper. 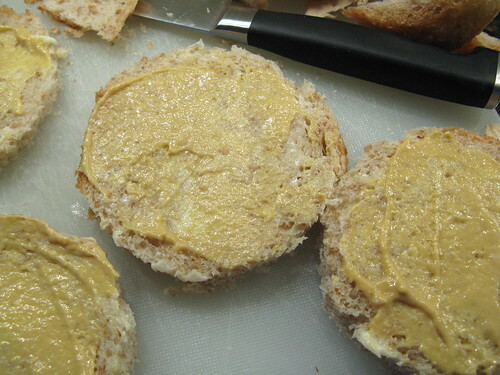 Lay one slice of bread in the bottom of each ramekin with the butter & mustard side up. Top with 1/3 of the leeks & cheeses. Pour about 1/3 of the egg mixture on top (for me this was about 4 soup spoons worth). Repeat two more times using up all the ingredients. Allow the ramekins to rest for 20 minutes so all the egg mixture gets soaked into the bread. 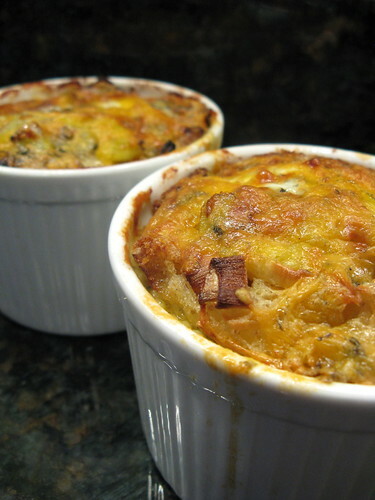 Place the ramekins on a baking sheet (the cheese oozes over the side & this will save your oven bottom). Bake for 30 - 40 minutes or until the cheeses are brown & bubbly. What a great idea for a side dish - a change from the things I usually serve! The small pnes are a good idea. I want to eat at your house. You make the best food! This sounds great. I like leeks a lot. Leeks, bacon, and blue cheese...that's what I'll do. I only have turkey bacon, but that's alright. And Lisa's right. You DO make the best food! Glad you enjoyed it. Im addicted to blue cheese so I always put loads in - it probably was a little overpowering for some!!!! Note taken with having a light hand with the cheese. This sounds like my kinid of dish, too. Kat, I am making this for my next dinner party! yum! I love leeks, and who doesn't love bread pudding? Good heavens, this looks so good! 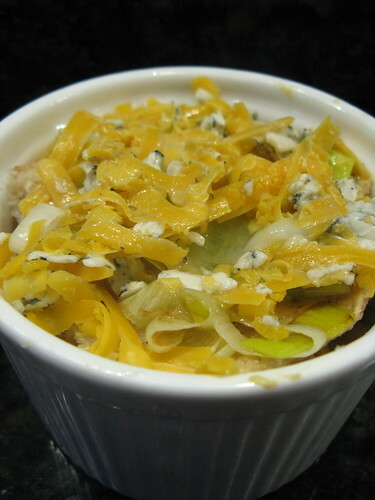 I love dishes like this, and this has two of my favorites: blue cheese and leeks!